This is how you make a big bad beetle-borg. In the future, when a spy worries about a room being bugged, she might have to look for actual bugs. Back in March we told you about Michel Maharbiz attaching electrodes to beetles’ brains to get them to beat their wings. Well, Maharbiz and his colleagues at the University of California Berkeley have taken the next step and taken their cyborg beetles out for a wireless flight. The experiment is funded by DARPA in the hopes of eventually creating a fully remote controlled spy insect that could listen in to conversations or possibly find missing people after a disaster. Check out the brief video from New Scientist below. In the recent experiment shown in the video, the species Mecynorrhina torquata was big enough to handle the necessary electronic devices to allow it to fly wirelessly. Looking at it, you almost can’t tell the beetle is under someone else’s control. Researchers are hopeful that whether or not the insects could be cybernetically enhanced to become spies or rescuers, they will still reveal interesting knowledge about the way the neural systems of insects function. The project is remarkable because the signals that the beetles are receiving aren’t very precise. Unlike another wireless neural system like Braingate, the Berkeley team isn’t targeting individual motor neurons. Large sections of the insect brain are being stimulated to get the beetle to take off, and again to begin landing, but continuous pulses don’t control the bug. Researchers steer the beetle left or right by stimulating muscle tissue. After the command for a turn is given, the beetle is allowed to right and balance itself. In other words, the remote controlled insect is actually much more like a horse with reigns. 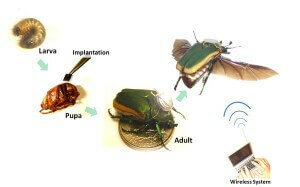 Creating cybernetic insect spies and rescuers involves implanting electrodes into beetles while they are still pupae. As the beetle matures, their capacity to carry electronics on their head increases, but it’s quite a battle to get devices small enough to be carried by the bugs. Batteries are heavy, and the beetles still haven’t been saddled with GPS trackers, cameras, microphones, or any of the various gizmos a spy might require. Considering the rapid pace that Maharbiz is keeping, he may have the beetles ready to fly missions before the electronics are small enough to ride shotgun. In fact, reliably powering electronics on that scale may require enough effort that creating robotic bugs will be a better choice than making cyborg ones. Still, it’s pretty cool that electric pulses applied to vague areas of beetle brains can essentially turn them into insect-sized beasts of burden. The next course of action should be to see if the Berkeley team can get their wireless flying bugs to navigate an obstacle course reliably. Whether or not we then see the beetles adapted to espionage, disaster relief, or a weird miniature version of NASCAR remains to be seen.